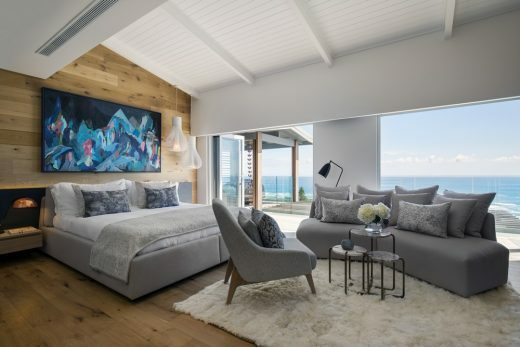 Being familiar with ARRCC’s design style, the client brief was to execute ARRCC’s signature style in a new and exciting way to create a modern coastal home with an ethnic edge. 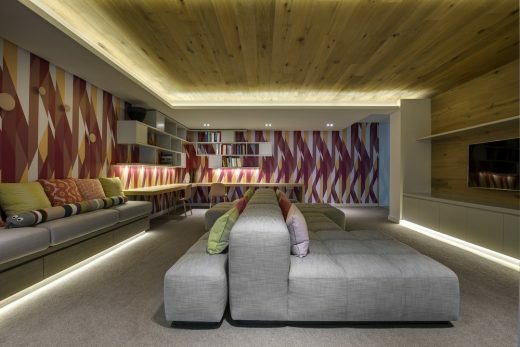 Keeping the family’s two children in mind, ARRCC strived to create a space that was contemporary and sophisticated, yet playful and fun. 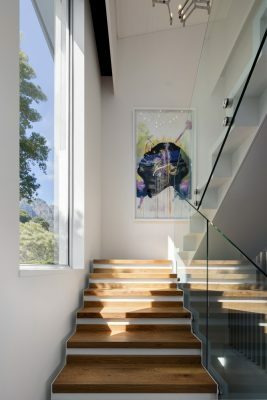 The existing structure was transformed into a large open space accommodating an inflow of natural light through the use of an array of reflective surfaces and large external aluminium screens which layer the exterior of the house. 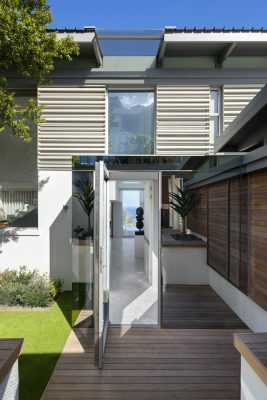 The entrance glass lobby is clad in reflective glass which accentuates the magnificent Twelve Apostles mountain views, while a garden oasis borders the walkway to the front door. The entrance level comprises a kitchen, dining and lounge area as well as a designated study and guest washroom. 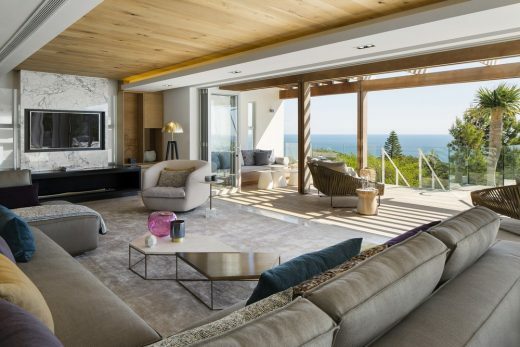 Dominating the living room is a slattered screen, boldly shaped with an organic design, generating movement and flow within the space. 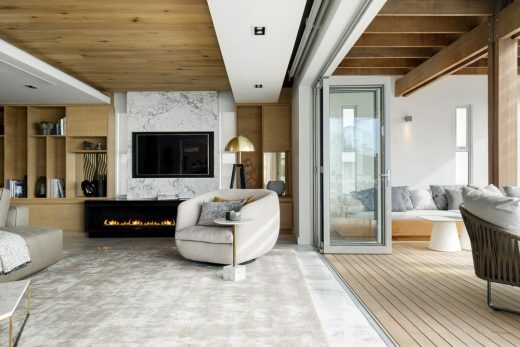 The Volakas marble floors offer a sophisticated design detail and set the colour palette of the space which is accented by French oak veneers with touches of bronze and metallics which add another layer to the interior design. 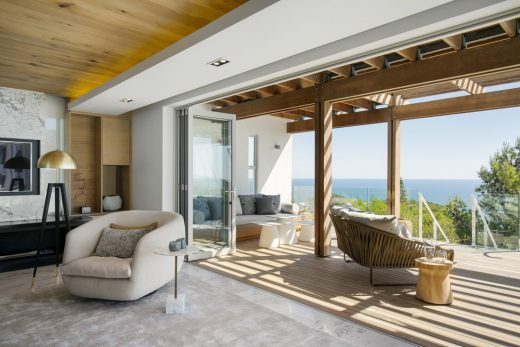 The entrance makes way for the living area which features a modern design aesthetic, incorporating OKHA furniture – a South African brand of bespoke design – using medium tones that add richness and personality to the space. 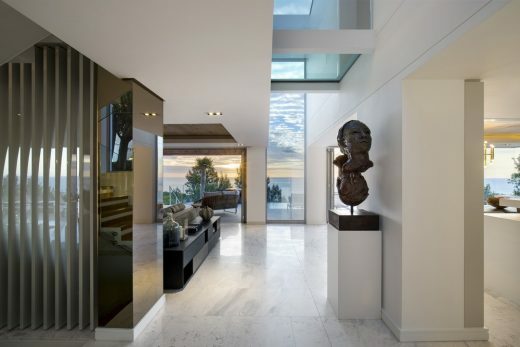 Artwork by local greats Lionel Smit and Nelson Makamo add a contemporary African feel to the spaces. 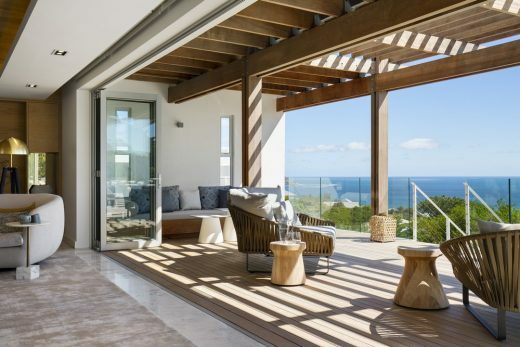 The living area opens up to the pool entertainment terrace with a covered lounge area, outside shower and infinity pool which leads the eye to views of the ocean. 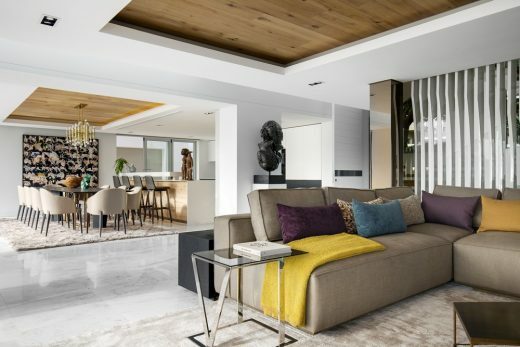 The kitchen, adjacent to the lounge and living space, accentuates the light, organic palette of the villa through its monochromatic and minimalistic design. This leads onto an outdoor space set with a BBQ to accommodate outdoor dining. Also on the entrance level off the lobby, a walkway leads to a selfcontained, private guest suite. 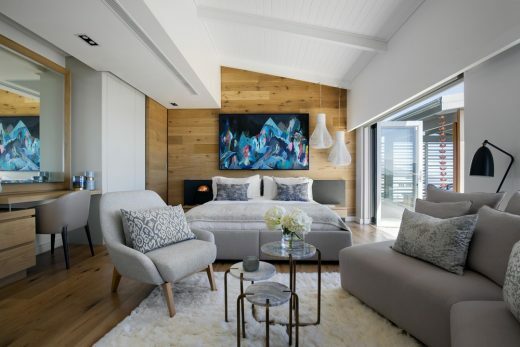 The guest suite features a contrasting colour palette to the main house, with dark wood furniture and a textured rug in olive green and mustard which compliments the artwork, by Emalie Bingham, above the bed. 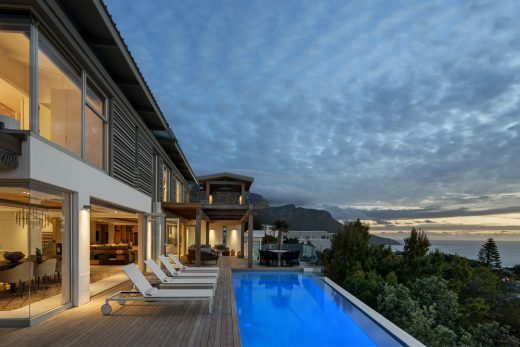 The entire house operates on an automated system from which the owner can control the lighting, heating, curtains and audio system. 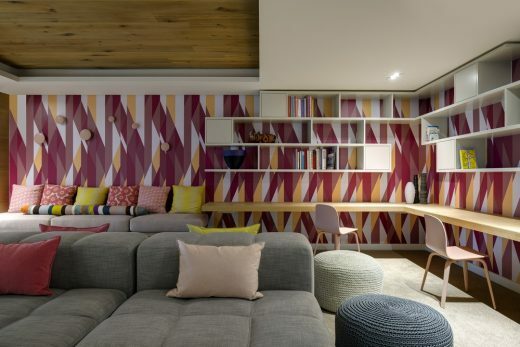 The lower level accommodates a kid’s playroom dressed with graphic wallpaper and a light colour scheme to create a fun and playful space. Double doors open to a vertical garden with a swing creating a feel of indoor-outdoor living. 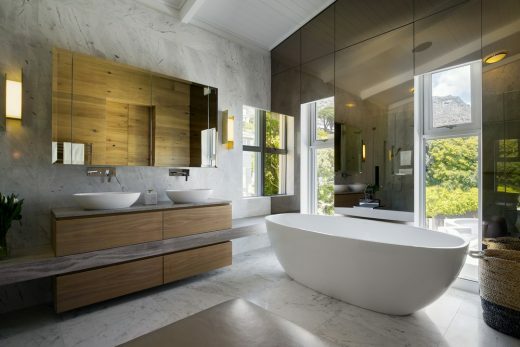 On the upper level, a glass bridge links two wings featuring the master bedroom and the two children’s bedrooms. 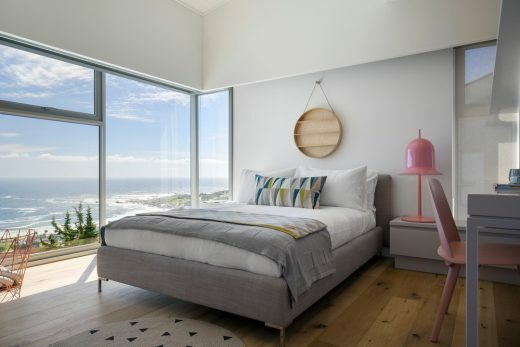 The master bedroom offers an en-suite bathroom and designated dressing room and opens up to a private exterior terrace with uninterrupted views from Lion’s Head to Llandudno. An authentic Peruvian Alpaca rug adds softness and texture to the space with the wall art above the bed bringing in an element of colour and personality to the room. With custom designed beds and graphic designed wallpaper, the children’s bedrooms are mirrored versions of each other with differing unique features to reflect a space that is lively and fun with strong African references. Art was widely used throughout the house to bring personality and emotion to the space. 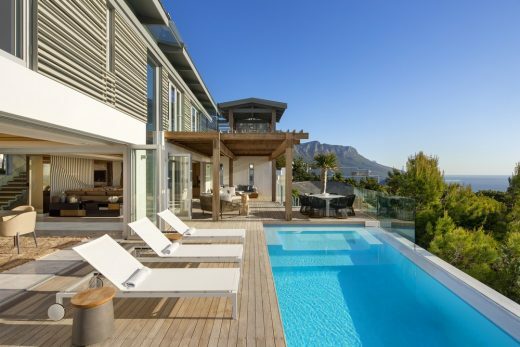 Nina Sierra Rubia, interior designer at ARRCC, talks about her inspiration and use of art pieces within the villa: “We saw the curation of the client’s art collection as an opportunity to showcase a mix of both established and up-and-coming South African artists. We incorporated some serious pieces such as the bust from Lionel Smit and a piece by Nelson Makamo, as well as a tongue-in-cheek installation art piece from Frank Van Reenen. 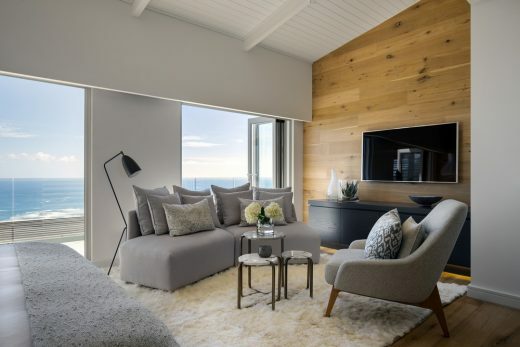 In this project, our biggest considerations were what worked with the scheme, the right format and most importantly, what suited the personalities of our clients,” says Nina. 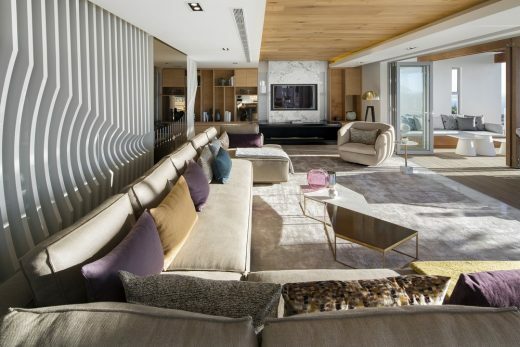 “While the internal spaces of the home are kept simple, signature ARRCC design elements and bespoke pieces create a modern and sophisticated presence while ensuring that the space reflects the personality of the home owner. 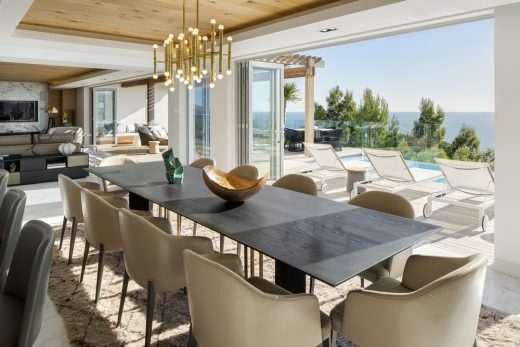 We used bold textures and fabrics to add richness to the space with the combination of glamourous and organic materials ensuring that this holiday retreat is the perfect balance between luxury and comfort,” says Jon Case, ARRCC director.